For those without comedic tastes, the so-called experts at Wikipedia have an article about Takeshi's Castle. Takeshi's Castle (Japanese: 風雲！たけし城, Fūun! Takeshi-jō Chaos and Endless War! Takeshi's Castle) is a 1987 jidaigeki film written and directed by Akira Kurosawa. Known as MXC in the US, due to worries that American audiences wouldn't know what a castle was, it is widely considered a cinematic masterpiece. The film documents a twisted general's futile attempts to capture the eponymous castle, as he leads his followers through a series of unbeatable water-based obstacles. General Lee is played by Kurosawa regular Toshiro Mifune and the villain Takeshi is played by controversial celebrity Takeshi 'Beat' Kitano. Craig Charles also stars as the Narrator. 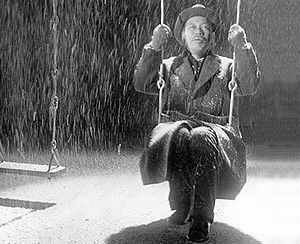 Kurosawa famously described Charles as "the king of water-based puns". 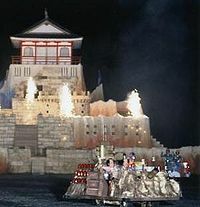 Whilst the rest of Kurosawa's oeuvre had been heavily influenced by classic Westerns and the works of Shakespeare, Takeshi's Castle is unique in that it was inspired by the various Japanese gameshows of the era. The film begins in a sombre, wintry valley. A slow tracking shot pans across to reveal various discarded paraphernalia: broken helmets, shredded flags, crimson trails of blood. A battle has been fought here. The camera eventually settles on the tall, determined figure of General Lee (Toshiro Mifune). He is gazing off into the distance. After some time, the camera cuts to show what he is looking at: a castle on the horizon. Cue a sudden jolt of dramatic music. This is Takeshi's Castle. The bridges in Medieval Japan weren't very practical. Lee intends to travel to, and take Takeshi's Castle as soon as possible, however he knows it will be no easy task. To aid him, he has gathered a small army of loyal followers. Poignantly, none of them are professional soldiers. Instead, they are ordinary people: stressed-out businessmen, overweight otakus, and pig-tailed girls with short skirts and a fear of heights. By characterising them in this way Kurosawa highlights the brutality of war - average people like you and me are embroiled in an endless, bloody crusade, and this touches us deeply. It is not long however before their charge is hindered. The invading army faces a great lake, separating them from their target. In Japanese cinematic tradition, a five minute static shot of the lake follows, then the action continues. It seems the only way to get to the other side is to leap across the stepping stones laid out before them. Several of the Contestants voice reservations to the General, but he ignores them and orders the troops to run across as fast as possible, regardless of the obvious danger. Observe the subtle acting on display here, you can really feel this character's pain. The group continues on their quest, moving deeper into the Japanese Mountains. After several long takes of them walking around (intercut with screenwipes), they come to a second lake, only this time there are no stepping stones to help them. It seems hopeless, until General Lee equips each of them with a long stick and explains curtly that they must pole vault across. The troops wearily acquiesce, and begin the difficult task of propelling themselves across the muddy water with the suspiciously bendy poles. One by one they fall to their watery graves. Kurosawa is relentless in showing us the horrific violence happening here: even going so far as to replay several of the deaths again in slow motion, thus forcing the audience to really contemplate the tragic loss of life. Few survive, and Lee seems increasingly troubled. After a hallowed silence, the narrator highlights the "flood of bad luck" that the Contestants are facing, and the soldiers press on. Lee commands his subordinates to "jiggle them". A long establishing shot reveals that Takeshi's Castle isn't much further, and Lee advises his followers to rejoice. Unfortunately, many of them are now dying of pneumonia due to having wet clothes. Others have more serious injuries, such as broken limbs and cuts. As if things weren't bad enough for the heroes, they find that to reach the castle they must cross yet another lake. General Lee is hopeful however, as this time there is a bridge for them to cross. Because of this, the army gets complacent, and they fail to see Takeshi's henchman lurking at the sidelines, waiting to hurl all manner of objects at them as they cross. The Contestants are taken by surprise. One man is knocked off by a rubber ball thrown by the enemies, whilst a huge polystyrene boulder takes out a whole group of wailing girls. Even Lee himself loses his footing when he is hit by an oversized inflatable hotdog. Luckily, he manages to grab on to the bridge from underneath and pull himself back up, causing the narrator to shout out in excitement. After some more horrific replays, Lee regroups and is devastated to find that only 7 of over 100 people have survived to this point. The rest are now, as Craig Charles puts it, "sleeping with the fishes". Undeterred, the General orders the final Contestants onwards into the threshold of Takeshi's Castle. Cue haunting trumpet blast (the first piece of music for over an hour). No one leaves Takeshi's Castle empty handed. In fact, no one leaves Takeshi's Castle at all. ...for what he knows will be the last time, and they charge. The Contestants are wiped out by the Emerald Guard in a matter of seconds. Kurosawa uses slow motion here, drawing out their deaths to make them as dramatic as possible. The militia cut them down one at a time with deadly and precise jets of water, and their freshly soaked bodies fall to the ground. Last to be squirted is General Lee, who crawls forward histrionically, reaching out to Takeshi. The overlord merely examines Lee's frail body, his expression cold. They share a moment, and then Lee collapses. Takeshi states that he has parted this world. 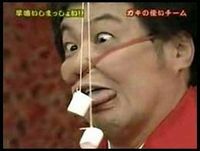 No winners on Takeshi's Castle this week. Takeshi's Castle is interesting in the way it has very little in terms of plot, and Kurosawa leaves out several key details. For instance we never learn exactly why General Lee and the Contestants must attack Takeshi's Castle, only that it is important enough for most of them to die for. The director also chose not to include any scene that might hint at General Lee's motivations, making everything from his goals to his strange choice of battle tactics seem completely illogical. The film is often analysed from a philosophical perspective. The persistent failure of Lee's crew against their obstacles is seen as another of Kurosawa's existentialist musings on the futility of life itself. The film is not so much a battle narrative as an exploration of the fragility of mortality and the certainty of death, and as Kurosawa shows, a watery grave awaits us all. Water is a recurring element in all of Kurosawa's films, but nowhere does it have more presence than in Takeshi's Castle, where it clearly represents loss and death. 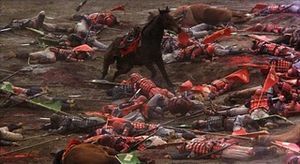 Portrayed once again by the director as a threatening force, water claims the lives of at least 143 people in the 3-hour running time, and also serves as the weapon with which Lord Takeshi finally defeats the protagonist, General Lee. When asked why he chose this particular artistic flourish, Kurosawa simply replied: "water..."
Kurosawa always insisted on being interviewed this way.